In a city that boasts hundreds of monuments to founding Philadelphians and esteemed visitors, only two publicly sanctioned, full-figured statues are dedicated to historic women: French heroine Joan of Arc and Bostonian Quaker Mary Dyer. In her project, Sharon Hayes sought to address this absence of women as well as the intersectional dynamics of race, gender-identity, sexuality, and class. Her sculpture, If They Should Ask, recognized a long line of Philadelphia women, from the mid-1600s to the present day, who could have been or could be recognized with monuments. 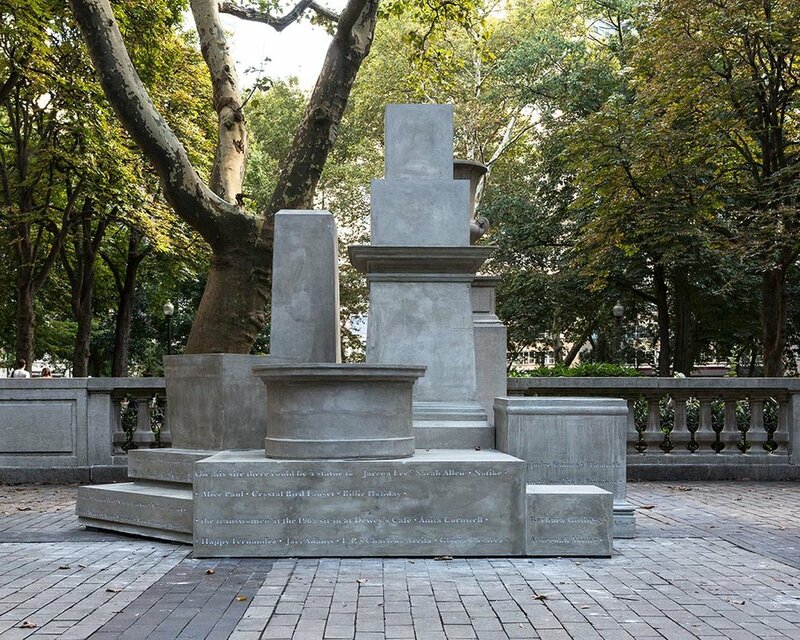 Hayes created nine pedestals—based on those on which statues of historic men currently stand across the city—and scaled them to half-size, casting them in concrete and clustering them together in a singular assemblage in the middle of Rittenhouse Square. To create the inscription that encircled the sculpture, Hayes convened a group of intergenerational, intersectional, and civically engaged women to discuss, as Hayes notes, “the persistent and aggressive exclusion of women from this form of public recognition.” Hayes and these interlocutors initiated an ongoing collection of names of Philadelphia-area women who have contributed to the social, cultural, political, and economic life of the city. A selection of these names were incorporated into the work. An accompanying installation of Hayes’s work related to this project was shown at the nearby Art Alliance. For a full list of names and to contribute your own, visit iftheyshouldask.com. If They Should Ask was recognized by the Americans for the Arts’ Public Art Network Year in Review as one of the top 50 outstanding public art projects from across the country in 2017. Partners: Mural Arts Philadelphia, The Pew Center for Arts & Heritage, The City of Philadelphia, Philadelphia Parks & Recreation, Friends of Rittenhouse Square, Philadelphia Art Alliance, and Amalgam Comics & Coffeehouse. If They Should Ask was presented as a part of the Monument Lab: Philadelphia (2017) exhibition. If They Should Ask is a temporary monument located in Rittenhouse Square that addresses the absence of monuments to women in the city of Philadelphia. The object is a collection of cast concrete pedestals sourced from existing monuments in Philadelphia and materialized at half-scale. Encircled with the names of women who contributed to civic and public life in Philadelphia from early European contact to the present day, If They Should Ask proposes that the persistent and aggressive exclusion of women from this form of public recognition perpetuates historical misunderstandings and reproduces inequality in the city’s economic, social, political, and cultural spheres. Although the city of Philadelphia is home to over 1,500 public sculptures, there are only two that celebrate the life of a real, historic woman—Joan of Arc and Mary Dyer, neither of whom were Philadelphia residents. The common understanding that such an exclusion is a consequence of a patriarchal system that did not value women’s contributions to public life tells only part of the story. This perception ignores the way in which monuments were utilized as part of a larger racial and gendered project in which whiteness and maleness are produced as identities of civic and political power. In this sense, material culture did not merely reflect political power but helped constitute it. Indeed, many white women were involved, individually and collectively, in organizing, advocating, fundraising, and commissioning large sculptures. That white women asserted their public power by constructing a material reality that consistently excluded them, and certainly excluded any women of color, is just one of the curious perversities that attend this moment of visual culture. Additionally, the political, social, and cultural labor done by women often did not move into or onto the historical record as women were not named or were misnamed as a result of intersecting conditions of racism, settler colonialism, homophobia, and transphobia. In pointing to the vast contributions that women (inclusive of trans women) make and have made to the city of Philadelphia, If They Should Ask proposes both that these contributions be remembered more actively and prominently in the commemorative objects that populate US cities, and also that to do so requires a collective effort of reimagining what a monument can and should be. Sharon Hayes is an artist who engages multiple mediums—video, performance, and installation—in ongoing investigation into specific intersections between history, politics and speech. Hayes’ work is concerned with developing new representational strategies that examine and interrogate the present political moment as a moment that reaches simultaneously backward and forward; a present moment that is never wholly its own but rather one that is full of multiple past moments and the speculations of multiple futures. From this ground, Hayes often addresses political events or movements from the 1960s through the 1990s. Her focus on the particular sphere of the near-past is influenced by the potent imbrication of private and public urgencies that she experienced in her own foundational encounters with feminism and AIDS activism. Hayes’ work has been staged on the street, in museums, galleries and exhibition spaces, in theater and dance venues, as well as in 45 lesbian living rooms across the US. Hayes has had solo exhibitions at Andrea Rosen Gallery (New York), Tanya Leighton Gallery (Berlin), the Whitney Museum of American Art (New York) and the Museo Nacional Centro de Arte Reina Sofia (Madrid). Her work been shown at the Venice Biennale (2013), the Museum of Modern Art (New York), the Guggenheim Museum (New York), the Institute of Contemporary Art, Philadelphia and numerous museums and venues in Europe and the Americas. Hayes is also a recipient of a Pew Fellowship (2016), Guggenheim Fellowship (2014), Alpert Award in Visual Arts (2013), Anonymous Was a Woman Award (2013), a Louis Comfort Tiffany Foundation Fellowship (2007) among other awards. Hayes teaches in the University of Pennsylvania’s Department of Fine Arts.